Color experts at the Pantone Color Institute have released their top ten colors for 2017. They’re quite a departure from the two Colors of the Year 2016, Rose Quartz and Serenity--also commonly known as baby pink and blue. If the pastel colors were too muted for your taste, behold, Pantone’s 2017 color choices are bigger and bolder with a sense of health, vitality, and nature interwoven. Take a look at the outdoor-inspired colors and names. If history is an indicator, Pantone will likely choose from its "10 Best of 2017" for the singular (or maybe two again!) color of the year in December. Why do we care about Pantone’s color choices? Well, we do and we don’t, actually. If you work in the fashion industry at all, then their color picks are extremely important because they affect what walks down the runway. If you're an average person, you may not really care, but the choices dictate what options are available to buy. Not just in clothing, but in home décor. Everything from linen napkins to the paint on the wall will have a touch of Pantone’s influence. 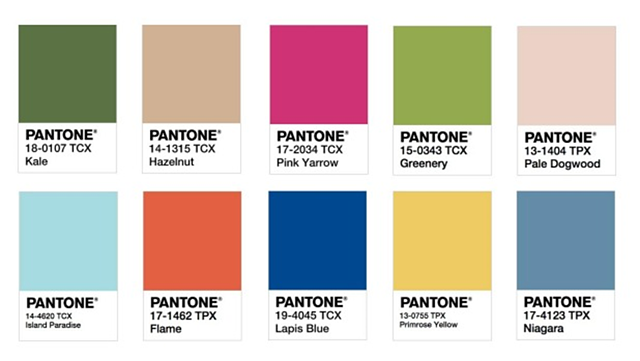 In addition to the top ten colors, Pantone also released nine different interior color palettes they think consumers will connect with in the upcoming year. Leatrice (Lee) Eiseman is the executive director of the Pantone Color Institute and debuted the collections at the International Home + Housewares Show back in March. Palette names like Day Dreaming, Florabundant, and Forest Bathing are bound to get your attention. When and how are Pantone’s colors chosen? It’s interesting to note that Pantone actually researches and analyzes trends throughout the world two years in advance of their release of the colors of the year. They rely on a careful mix of the influence of current events, pop culture, and what they feel will be trending in the future. Because Pantone researched and selected from trends seen two years ago, my bet is on Kale for the 2017 Color of the Year, since it was picked pre-kale backlash. Sherwin-Williams and Benjamin Moore are two names many homeowners recognize, so I thought it would be a good idea to recognize what their color designers feel consumers would like to see in their homes this year. Poised Taupe. The company describes the hue as a cozy earthen brown and grey mixture. Continuing with the popularity of grey, Poised Taupe looks like another good option for an updated neutral. Shadow. “...allusive and enigmatic — a master of ambiance.” Relying heavily on the shifting light, Benjamin Moore’s creative director suggests the deep purple’s appearance can evolve from amethyst to a soft lilac grey. Both companies provide additional color palette suggestions that will complement their colors of the year. Whether we are fully aware as consumers why exactly we buy what we buy or why we like what we like, Pantone and other fashion and design companies are betting the research they put into their colors of the year will draw buyers in one way or another. Educated consumers are the best kind to be, and MilitaryByOwner has so many resources to help buyers make the best decisions for their real estate money. Information on buying, selling, renting, or home decorating--it’s all there!